When a column of mine titled “The Atrocious Mathematics of the Gospel” appeared in Christianity Today magazine, I soon learned that not everyone appreciates satire. Response letters scorched the inside of my mailbox. “Philip Yancey, you do not walk with God or with Jesus!” wrote one irate reader; “This column is blasphemy.” Another condemned my “antichristian, intellectualized philosophies.” Yet another reader labeled me “satanic.” “Are there not enough review editors on your staff to weed out such sophomoric tripe?” he asked the editor. Feeling chastened, and unaccustomed to being regarded as blasphemous, antichristian, and satanic, I went back and puzzled over that column. What had gone wrong? I had taken four stories, one from each of the Gospels, and with tongue obviously in cheek — or so I thought — pointed out the absurdity of the mathematics involved. Luke tells of a shepherd who left his flock of ninety-nine and plunged into the darkness to search for one lost sheep. A noble deed, to be sure, but reflect for a moment on the underlying arithmetic. Jesus says the shepherd left the ninety-nine sheep “in the country,” which presumably means vulnerable to rustlers, wolves, or a feral desire to bolt free. How would the shepherd feel if he returned with the one lost lamb slung across his shoulders only to find twenty-three others now missing? In a scene recounted in John, a woman named Mary took a pint — worth a year’s wages! — of exotic perfume and poured it on Jesus’ feet. Think of the wastefulness. Would not an ounce of perfume accomplish the same purpose? Even Judas could see the absurdity: the treasure now running in fragrant rivulets across the dirt floor could have been sold to help the poor. Mark records yet a third scene. After watching a widow drop two puny coins in the temple collection bucket, Jesus belittled more hefty contributions. “I tell you the truth,” he remarked, “this poor widow has put more into the treasury than all the others.” I hope he said those words softly, for major donors would not appreciate the comparison. The fourth story, from Matthew, involves a parable I have heard few sermons preached on, with good reason. Jesus told of a farmer who hired people to work his vineyards. Some clocked in at sunrise, some at morning coffee break, some at lunchtime, some at afternoon coffee break, and some an hour before quitting time. Everybody seemed content until payroll time, when the stalwarts who had worked twelve hours under a blazing sun learned that the sweat less upstarts who had put in barely an hour would receive exactly the same pay. The boss’s action contradicted everything known about employee motivation and fair compensation. It was atrocious economics, plain and simple. Besides learning a lesson about satire with that column, I also learned an important lesson about grace. Perhaps the word “atrocious” was ill-chosen, but surely grace sounds a shrill note of unfairness. Why should a widow’s pennies count more than a rich man’s millions? And what employer would pay Johnny-come-late-lies the same as his trusted regulars? Not long after writing the column, I attended Amadeus (Latin for “beloved of God”), a play that shows a composer in the eighteenth century seeking to understand the mind of God. The devout Antonio Salieri has the earnest desire, but not the aptitude, to create immortal music of praise. It infuriates him that God has instead lavished the greatest gift of musical genius ever known on an impish preadolescent named Wolfgang Amadeus Mozart. Why would God choose Jacob the conniver over dutiful Esau? Why confer supernatural powers of strength on a Mozartian delinquent named Samson? Why groom a runty shepherd boy, David, to be Israel’s king? And why bestow a sublime gift of wisdom on Solomon, the fruit of that king’s adulterous liaison? Indeed, in each of these Old Testament stories the scandal of grace rumbles under the surface until finally, in Jesus’ parables, it bursts forth in a dramatic upheaval to reshape the moral landscape. Jesus’ parable of the workers and their grossly unfair paychecks confronts this scandal head-on. In a contemporary Jewish version of this story, the workers hired late in the afternoon work so hard that the employer, impressed, decides to award them a full day’s wages. Not so in Jesus’ version, which notes that the last crop of workers have been idly standing around in the marketplace, something only lazy, shiftless workers would do during harvest season. Moreover, these laggards do nothing to distinguish themselves, and the other workers are shocked by the pay they receive. What employer in his right mind would pay the same amount for one hour’s work as for twelve! Friend, I am not being unfair to you. Didn’t you agree to work for a denarius? Take your pay and go. I want to give the man who was hired last the same as I gave you. Don’t I have the right to do what I want with my own money? Or are you envious because I am generous? Are you, Salieri, envious because I am so generous to Mozart? Are you, Saul, envious because I am so generous to David? Are you Pharisees envious because I open the gate to Gentiles so late in the game? That I honor the prayer of a tax collector above a Pharisee’s, that I accept a thief’s last-minute confession and welcome him to Paradise — does this arouse your envy? Do you begrudge my leaving the obedient flock to seek the stray or my serving a fatted calf to the no-good prodigal? The employer in Jesus’ story did not cheat the full-day workers by paying everyone for one hour’s work instead of twelve. No, the full-day workers got what they were promised. Their discontent arose from the scandalous mathematics of grace. They could not accept that their employer had the right to do what he wanted with his money when it meant paying scoundrels twelve times what they deserved. Significantly, many Christians who study this parable identify with the employees who put in a full day’s work, rather than the add-ons at the end of the day. We like to think of ourselves as responsible workers, and the employer’s strange behavior baffles us as it did the original hearers. We risk missing the story’s point: that God dispenses gifts, not wages. None of us gets paid according to merit, for none of us comes close to satisfying God’s requirements for a perfect life. If paid on the basis of fairness, we would all end up in hell. Grace cannot be reduced to generally accepted accounting principles. In the bottom-line realm of ungrace, some workers deserve more than others; in the realm of grace the word deserve does not even apply. By my reckoning Judas and Peter stand out as the most mathematical of the disciples. Judas must have shown some facility with numbers or the others would not have elected him treasurer. Peter was a stickler for detail, always trying to pin down Jesus’ precise meaning. Also, the Gospels record that when Jesus engineered a miraculous catch of fish, Peter hauled in 153 big ones. Who but a mathematician would have bothered to count the squirming pile? It was altogether in character, then, for the scrupulous apostle Peter to pursue some mathematical formula of grace. “How many times shall I forgive my brother when he sins against me?” he asked Jesus. “Up to seven times?” Peter was erring on the side of magnanimity, for the rabbis in his day had suggested three as the maximum number of times one might be expected to forgive. “Not seven times, but seventy-seven times,” replied Jesus in a flash. Some manuscripts have “seventy times seven,” but it hardly matters whether Jesus said 77 or 490: forgiveness, he implied, is not the kind of thing you count on an abacus. Peter’s question prompted another of Jesus’ trenchant stories, about a servant who has somehow piled up a debt of several million dollars. The fact that realistically no servant could accumulate a debt so huge underscores Jesus’ point: confiscating the man’s family, children, and all his property would not make a dent in repaying the debt. It is unforgivable. Nevertheless the king, touched with pity, abruptly cancels the debt and lets the servant off scot-free. Suddenly, the plot twists. The servant who has just been forgiven seizes a colleague who owes him a few dollars and begins to choke him. “Pay back what you owe me!” he demands, and throws the man into jail. In a word, the greedy servant is an ingrate. Why Jesus draws the parable with such exaggerated strokes comes clear when he reveals that the king represents God. This above all should determine our attitude toward others: a humble awareness that God has already forgiven us a debt so mountainous that beside it any person’s wrongs against us shrink to the size of anthills. How can we not forgive each other in light of all God has forgiven us? The more I reflect on Jesus’ parables, the more tempted I am to reclaim the word “atrocious” to describe the mathematics of the gospel. From nursery school onward we are taught how to succeed in the world of ungrace. The early bird gets the worm. No pain, no gain. There is no such thing as a free lunch. Demand your rights. Get what you pay for. I know these rules well because I live by them. I work for what I earn; I like to win; I insist on my rights. I want people to get what they deserve — nothing more, nothing less. Yet if I care to listen, I hear a loud whisper from the gospel that I did not get what I deserved. I deserved punishment and got forgiveness. I deserved wrath and got love. I deserved debtor’s prison and got instead a clean credit history. I deserved stern lectures and crawl-on-your-knees repentance; I got a banquet — Babette’s feast — spread for me. To God be the glory for His mercy and grace. 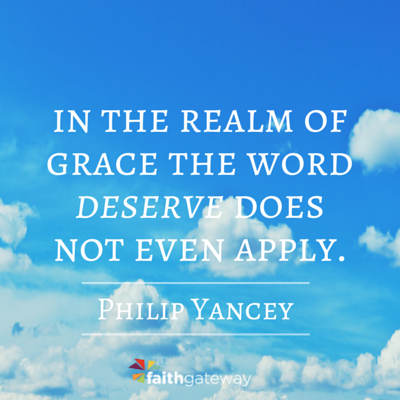 Excerpted from What’s So Amazing About Grace by Philip Yancey, copyright Zondervan. How often are each of us an Antonio Salieri when faced with an Wolfgang Amadeus Mozart? How you ever felt frustrated by the injustice of God’s grace on the life of someone who doesn’t deserve it? Come share with us here on our blog! We want to hear from you.